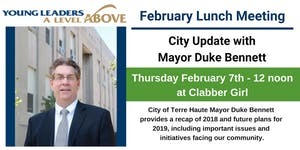 Come prepared to hear the City of Terre Haute Mayor Duke Bennett's recap of 2018 and future plans for 2019. This will include important issues and initiatives facing our community. Click here to register for this Terre Haute Young Leader event.